Slightly hilly country Vrcha extend like in the mirror of Orlice Mountains in the southwest part of Rychnovsky region at the lowland part of Orlicka plane. Region with many small streams and brooks offers unforgettable outlook not only for Orlice Mountains but also for Giant Mountains with the highest peak Snezka. The look out tower Osicina at 413 m high overtooks forested valley Drizna with quiet place of pilgrimage and Virgin Mary from Lurdy Chapel. Downhill from that tower is extended view of Kralicky Sneznik, Zelezne Mountains and Kuneticka hill. The area Vrcha associates eleven villages from Rychnovsky region (alliance DSO Vrchy and Dolni Bela) that is famous for survive four manors (Castle Rychnov nad Kneznou, Castolovice, Doudleby, Kostelec nad Orlici, Opocno). Property-owning noble families were very influenced in that region. Picturesque slightly hilly landscape Vrcha is perfected not only for walking trips but for cycling trips as well. 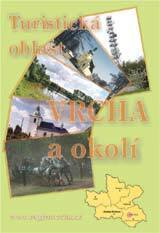 Promotional book about tourist area Vrcha was published in April 2006. All eleven villages (from Alliance Vrcha and Dolni Bela) are presented on 40 pages. Pocket-size book with many pictures and further information about local life is filled with tips for trips. Book is useful tour guide to landscape around Osicina lookout tower and you can buy it in every local information centres and municipal authorities. For better orientation there are information tables in every villages with short historical stories, pictures of interesting objects and detailed maps of local cycle path.